My friend and fellow author Justin Aucoin has asked me to carry the torch for another leg in a great "Meet My Main Character" blog-hop. This is an opportunity for writers to introduce to readers the main character of a work in progress or soon-to-be-published work. So, I'm picking Jamie Lynch, the MC of my current work in progress. Before reading more, be sure to check out Justin's blog post, where we meet his main character, Jake Hawking. My character's name is Jamie "Hangman" Lynch. He's a fictional character, part of my "Lynch Family Legacy" of characters featured in my other books, such as KILLER INSTINCTS and my COMMANDO series of WW2 novels. Jamie is the son of COMMANDO's Tommy Lynch and uncle to KI's William Lynch. The story is set in 1973, and starts in San Diego, California. The story quickly moves up the coast to San Francisco, where events take place all over the Bay area, from Palo Alto to Bodega Bay. Jamie's 24 years old in 1973. He's a former sergeant in the United States Army, 5th Special Forces Group, and from 1970-72, served in the top-secret Military Assistance Command, Vietnam - Studies and Observations Group (MACV-SOG). Previous to that, he was a corporal in the 101st Airborne Division, and fought in the Battle of Hamburger Hill in 1969, where he was wounded. In 1973, Jamie has been out of the military for about nine months, living above a surf shop along Mission Beach in San Diego. Jamie made it back from Vietnam in fairly good shape, both physically and mentally. He suffered a few minor wounds, but he's in prime physical condition. Mentally he's doing okay, although he has recurring dreams and nightmares about the war. Most recently, his dreams have involved going back to the war, and even though in some of his dreams he gets killed, the overall sense in his dreams is that Jamie is happy to be back "home" in the war. He's self-aware enough to realize that the hum-drum civilian life isn't for him; he's spent his entire adult life so far in the military, training for and fighting in a war, and now he's basically a beach bum, living off some money set aside and working a part-time job in the surf shop he lives above. Jamie begins to feel like "a tiger in a cage, restless and confined", and worries that one day he'll channel that aggression and confined feeling in a way that will wind up with him in jail, dead, or some other unfortunate outcome. So, Jamie gets in touch with General Carson, an officer who used to be Jamie's CO back in Vietnam. He confesses his problems and asks Carson for help. Carson tells Jamie he knows of a businessman up in San Francisco, the head of a tech company with strong ties to military technology research, who is in need of someone with Jamie's skill set to "solve a problem". Jamie, not caring much what the problem is and only knowing it'd give him an escape from his cage of inactivity and boredom, accepts the job. A great deal of violent conflict ensues shortly thereafter. Jamie's primary motivation throughout the story is to find purpose in his civilian life. Like many veterans, he's come back to the "real world" after being in the military for over five years, and the Army is the only adult life he's ever known, and his skills-set is, at the very least, pretty specific. He can't picture himself living the life of a 9-to-5 office dweller, driving to work every morning in a station wagon, typing up reports and sitting in meetings, then going home at the end of the day to a house surrounded by a white picket fence, containing a darling wife and two perfect children. Even at the young age of 24, Jamie firmly believes there's no way that kind of life is his destiny. On the other hand, Jamie understands that selling his lethal skills in the private sector is a dangerous game. As the story unfolds, and the events begin to spiral out of control, with more and more collateral damage and unforeseen consequences, Jamie realizes he's essentially a murderous criminal, and there's a good chance his actions might get him killed or sent to prison for the rest of his life - exactly the sort of outcome he was trying to avoid in the first place. On the other hand, he's got several other characters in the story, especially the mysterious gun-for-hire named Richard, affirming that this is the life for him. It becomes a tug-of-war between Jamie's moral character, and his belief in his ultimate place in the world outside of the Army. 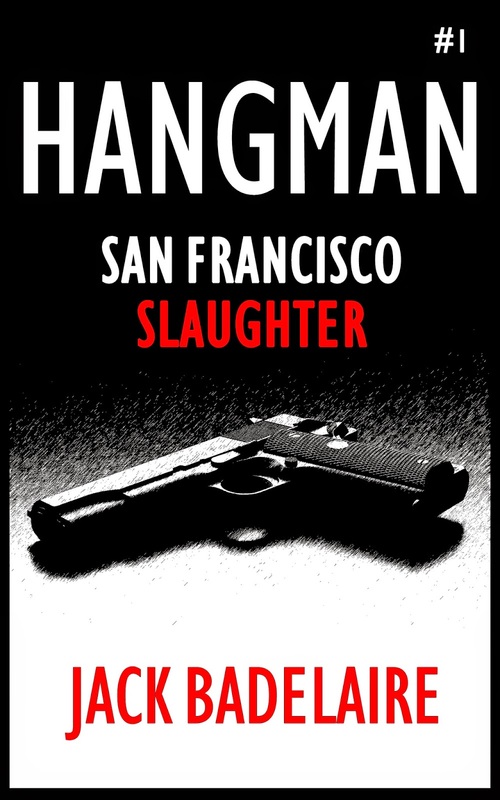 The book is titled HANGMAN: SAN FRANCISCO SLAUGHTER. I hope this will be the first in a series of short novels featuring Jamie as he goes on further adventures, all under the HANGMAN series title. I wrote a teaser blog post regarding the book here. I hope to have the first draft completed by the beginning of May, and off to a small cadre of interested Beta readers. Depending on their feedback, and the amount of rewriting I have to do nor not do, I hope to have the novel out on Amazon for the Kindle and Trade Paperback formats some time in June. UPDATE: Author Mark Allen is the next stop on this blog-hop - you can meet his main character, Travis Kain, here on his page. RENEGADE'S REVENGE - On Sale Now! 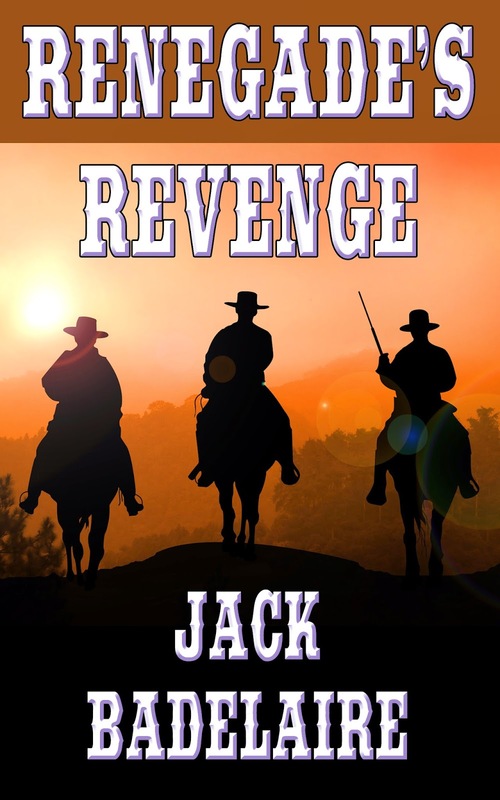 I'm happy to say RENEGADE'S REVENGE, my first Western story, is now available on the Kindle store for $0.99, with a Trade Paperback version to come some time in the next couple of weeks. I had a lot of fun writing this 20,000 word novella, and there is a possibility of a sequel if interest is high enough. At the start of the Civil War, twin brothers David and Caleb Miller found themselves on different sides of the battle lines. David enlisted in a Union cavalry regiment, while Caleb joined a band of Missouri irregulars, the infamous "Bushwhackers". In the war's last days, Caleb's Bushwhackers ambush David's cavalry unit, but when the Union troopers gain the upper hand, the Confederates are forced to surrender. The two brothers are brought together again mere moments before Caleb is murdered on the orders of Captain McNeil, David's superior officer. Months after the war's end, David returns home and reunites with his older brother Paul, himself a former Confederate irregular. The two brothers vow to hunt down Captain McNeil and exact retribution for Caleb's murder, but not only will they have to find McNeil, they'll have to fight their way through a score of war-hardened, ruthless veterans in order to bring him to justice. Renegade's Revenge is a story of duty and brotherhood, revenge and retribution, war and the scars it leaves behind, both physical and emotional. When I first saw the trailers for Sabotage, I was enthused but otherwise wasn't expecting much. I've been happy to see Schwarzenegger making a Hollywood comeback, because even in his "retirement" years, he's still a badass. I really enjoyed The Last Stand, and even Escape Plan was a lot of fun, if somewhat goofy. So, this latest action flick looked to be more of the same. Dudes with guns running around killing other dudes with guns, some chases, some revenge, some shots of Arnold glowering menacingly. Pretty standard stuff, really. Right? This movie is brutal. I don't mean brutal as in Commando-era Arnold running around hosing down countless pissant soldiers who pirouette and drop to the ground when shot. I mean gruesomely, unrelentingly violent. This is easily the most graphically violent movie Schwarzenegger has ever done, and I don't say that lightly. 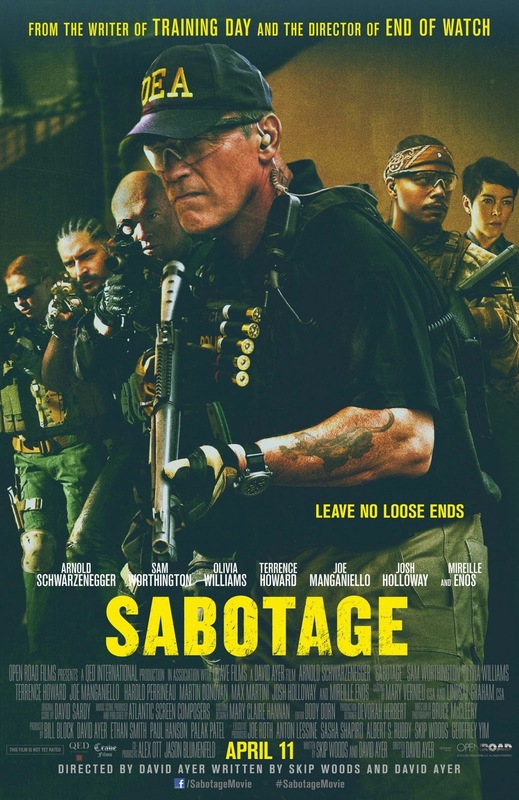 While his movies have high body counts, and some (like Total Recall) have some messy bits, the graphic, in-your-face nature of the violence in Sabotage is unique to his career. While I can get icked out by torture scenes in movies, graphic violence usually doesn't phase me much...but I was uncomfortable at times with this film, and that's saying something. Furthermore, this is Arnold like we've never seen him before. There has always been at least a hint that Schwarzenegger is winking to the audience in his movies. The "I'll be back" line, the posing with the guns a la Commando, the corny one-liners, and so forth. We've come to expect it, to the point where we don't even notice it until it's gone. But in Sabotage, there's none of that Schwarzenegger self-referentialism. I won't say he's "acting" better than ever, but he is able to, more than I've ever seen him, put away his Hollywood MegaStar-ness and just play a role as straight as possible, without any mugging or otherwise playing "Arnold". As for the movie itself, there's nothing truly original or jaw-dropping here. Schwarzenegger plays "Breacher" Wharton, an old, grizzled DEA door-kicker (thus, the "Breacher" moniker) who leads an undercover team of agents who infiltrate drug organizations, then tear them apart. These guys are the DEA version of Delta Force and Seal Team Six, unconventional warfare types who roll with lots of tattoos and facial hair and highly customized kit loadouts. As the movie opens, they're taking down some drug cartel and they hide ten million dollars in cash on the premises, hoping to steal the money for themselves, but when they return for the money, someone's taken it. Whoops. Come to find out, the FBI was running an operation in parallel with theirs, and knew how much money was in the place, so the fact that ten million dollars is missing doesn't go unnoticed, either by the DEA or the Cartel, who doesn't like losing their money to the government, but likes having it stolen by government agents for their own personal use even less. But of course, the thieves can't tell anyone it was stolen from them without admitting they stole it in the first place. Six months of investigation and interrogation by the DEA, and none of the members breaks, and they're finally - begrudgingly - put back on the job. I don't want to give away any spoilers, because this movie does have a few twists and turns that are definitely worth keeping hidden. Suffice to say, some members of the team start getting killed. Breacher and the surviving members begin to turn on each other, assuming that the Cartel is coming after their money, and they all begin to suspect that someone on the team beat the rest to the money and took it for themselves. We also begin to learn some dark aspects of Breacher's past, as well as seeing the tensions and conflicts within the team. Operators who always live on the ragged edge of right and wrong can lose track of where the line is drawn, and that becomes a very scary place to live. Badass Digest, one of my favorite film and television websites, wrote a really good review of this film, one that I more or less agree with. This isn't a "great movie", but it is one of the best Schwarzenegger movies, and if you're a fan of his films, you really need to see this. Even after more than 30 years of movie stardom, the big guy can still surprise us. I've read both THE SCAVENGER and Sean's first Toxic World novel, RADIO HOPE, and they're both great stories. Post-Apocalyptic fiction that isn't hyperbolized or filled with zombies (yawn...), these are great stories filled with believable characters and great action. 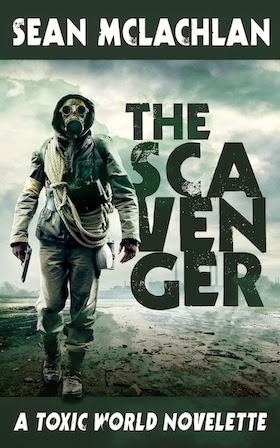 If you're interested, pick up THE SCAVENGER for free between now and April 8th. In a world shattered by war, pollution, and disease, a lone scavenger discovers a priceless relic from the Old Times. The problem is, it's stuck in the middle of the worst wasteland he knows--a contaminated city inhabited by insane chem addicts and vengeful villagers. Only his wits, his gun, and an unlikely ally can get him out alive. Set in the Toxic World series introduced in the novel Radio Hope, this 10,000-word story explores more of the dangers and personalities that make up a post-apocalyptic world that's all too possible.